By mixing advanced safety systems such as the Pre-crash Brake, the Lane Departure Warning System, and the Millimeter-Wave Inter-Vehicle Distance Warning, we improve safety and contribute to a reduction in driver fatigue and enable daily safe driving. 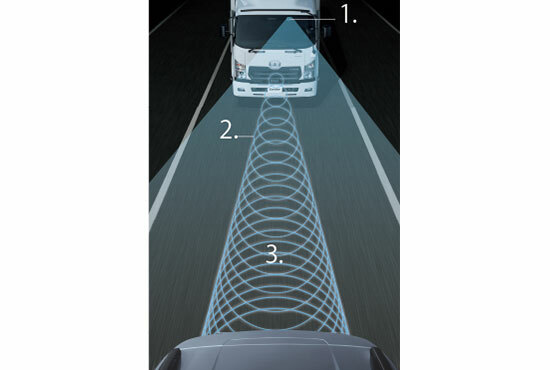 While driving, the millimeter-wave radar and the camera detect and analyze the front of the vehicle at all times. Depending on the distance of the vehicle ahead, the alarm (system) and brake control will work automatically. When the possibility of a collision with the vehicle ahead slowly increases, in addition to the alarm, full-braking is applied at an early stage to prevent a collision. If the collision cannot be avoided, the brake is automatically applied to reduce the collision speed and damage. * Standard equipment for GVW 8-ton <210 ps, 240 ps> / 11-ton vehicles, Option for GVW 7.5-ton / GVW 8-ton <190 ps> / 14.5-16ton vehicles. * Pre-crash Brake is a system to support the safe driving of the driver, and is not a system that can be used to enable exceeding the limits of the vehicle. Without overestimating this device, keep in mind safe driving. The camera detects white lines on both sides of the traffic lane, and when the vehicle is likely to deviate from the traffic lane, an alarm sounds from the right and left speakers, and a warning is displayed on the multi-display to alert the driver. * It operates when the vehicle speed is traveling at 60 km/h or more. Not available for 4WD vehicles. 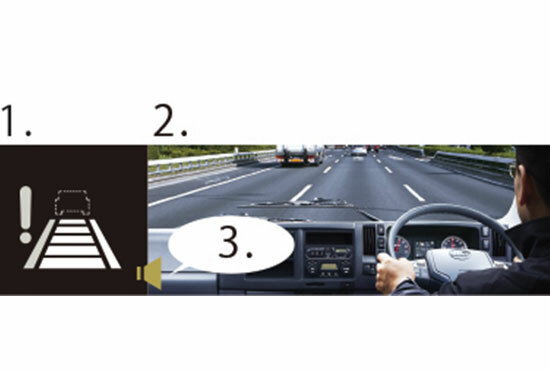 * Lane Departure Warning System [LDWS] is a system to support the safe driving of the driver, and is not a system that can be used to enable exceeding the limits of the vehicle. Without overestimating this device, keep in mind safe driving. It detects the distance from the vehicle ahead, and when the vehicle encroaches beyond the margin of safety, the alarm sounds and a warning is displayed on the multi-display, alerting the driver to avoid the danger. * Not available as a single option. When Pre-crash Brake is selected, it is standard equipment. * Millimeter-Wave Inter-Vehicle Distance Warning is a system to support the safe driving of the driver, and is not a system that can be used to enable exceeding the limits of the vehicle. Without overestimating this device, keep in mind safe driving. 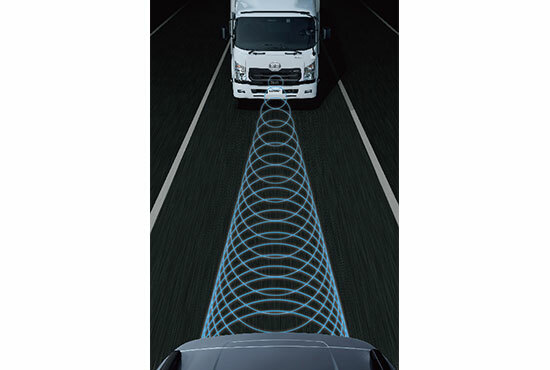 The sensor detects the operational state by the driver and the behavior of the vehicle. An alarm is raised when it is judged as unstable condition which could cause skidding or a rollover. Also simultaneously it performs automatic control of the engine and brakes and contributes to accident prevention. * ESC is a system to support safe driving by the driver, and not a system that can be used to enable exceeding the limits of the vehicle. Without overestimating this device, keep in mind safe driving. These are installed in the driver’s seat of all vehicles as standard features. These features, as well as the cabin with the impact relaxation function, provide drivers with safety and shock mitigation. These features are also installed in the passenger’s seat for fellow passengers’ safety. 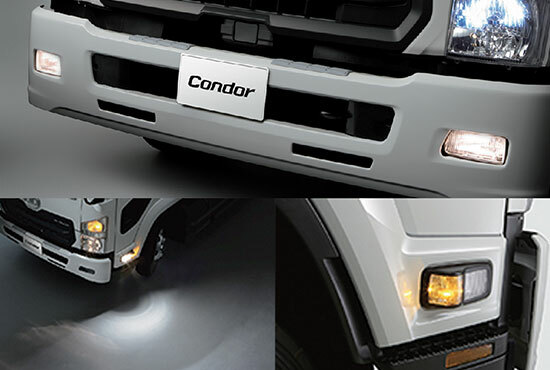 If a passenger car collides with a Condor from the front or the back, damage to the passengers in the car will be reduced by preventing the car from sliding underneath the truck. 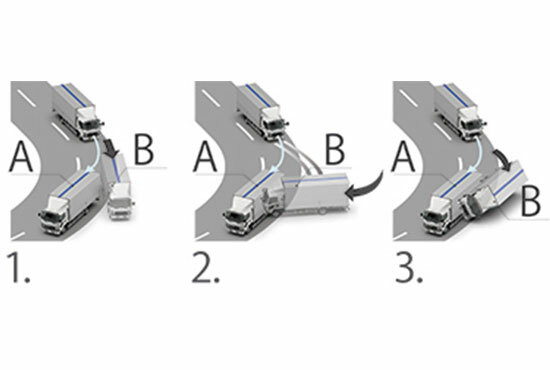 This feature absorbs the impact generated form the movement and deformation of the vehicle due to strong head-on collisions, and restricts it from being transmitted to the driver. The front window with good visibility provides safety and contributes to driving fatigue reduction. 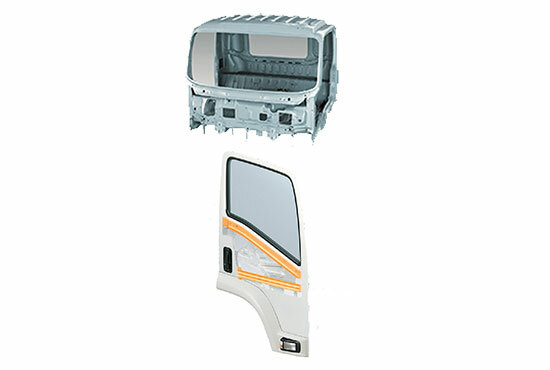 The wide vertical vision enables drivers to recognize traffic signals and signs easily. The variable intermittent function is equipped on the wipers. This feature assists the driver to maintain optimal vision according to the weather conditions. The immobilizer is an advanced electronic locking system to control the engine start, which is unreproducible and presently provides the highest level of security. The circuits have enhanced waterproof properties that allow operation of the power windows for some time in the event of the vehicle becoming submerged in water.